If you have more penalties than rolling, you cannot have roller derby. September 13, 2009 was a very significant date in the history of modern roller derby. Do you remember what happened then? (Derby News Network) RALEIGH, NC — Philly and Gotham provided what was by far the most dramatic bout of the Eastern Regionals, trading the lead all through the second half — and 4 times in the last jam alone — before Philly scored a one-point upset of Gotham to end Gotham’s two-year, 18 game winning streak by just one last-second point, 90-89. It was the day Philly upset Gotham. Their game was an epic contest that featured everything that makes roller derby, roller derby: Speed, constant action, great blocking, amazing teamwork, and competitive on the scoreboard the whole way through. As if that wasn’t enough, the last jam of the game went the full two minutes, culminating with Philly’s Teflon Donna literally making a last-second pass to pick up a point on the track and a ghost point in the box…the two points they needed to overcome Gotham and win the regional title. The game was amazing in every respect. Personally, I hold it near and dear to my heart. It instantly sold me on flat track roller derby, and showed me everything that was good about the modern game. There are two things about it that will forever be ingrained in my memories. The first is what happened at the end of the game. When Philly realized they had won, their entire bench came out and dogpiled onto Teflon in mad celebration. By itself, this moment was amazing. But then Gotham joined in the celebration and also jumped onto the dogpile. That made the moment legendary. A pile of humanity containing Gotham and Philly skaters. Awesome! Right then and there, I got it. I understood how teams could be fiercely competitive and still be part of a community that just wants to have fun playing roller derby. That winners and losers can mingling in the same ball of joyful humanity after a nail-biting finish told me all I needed to know about the people playing the game. However, it’s the second thing that I took away from Gotham/Philly 2009 that has been on my mind a lot lately. As exciting as the finish was, I was more impressed with the start of the game. In light of recent events, you may have a hard time believing this: For the first ten minutes of the bout, there were no major penalties committed by either team. I was gobsmacked. Finally, I thought. The best teams playing the best roller derby, skating hard, skating fast, and skating clean, playing the game five-on-five for an extended period of time. As it should be! Inevitably, penalties factored into the game. A penalty directly influenced the final result, obviously, as a last-minute blocker penalty by Gotham gave Philly the last-second ghost point they needed to topple the giants and end their years-long win streak. Even so, this game showed me how quickly derby skaters were bettering themselves and their abilities, proving that they could skate hard without committing penalties. I envisioned roller derby games with fierce action and very few penalties, as is the way in other sports. I was stoked. Surely, I thought at the time, this was the springboard towards a bright future. Two months after Philly’s historic upset, Denver started to tug on loopholes in the rule book at west region playoffs. Ever since then, derby has been getting slower and more sloppy, ultimately culminating with Gotham solving the rules and coming up with unbeatable strategies, directly resulting in red-faced referees gasping for air, whistling more penalties than ever. This has turned derby into a mindless farce, and a shadow of what the game used to be just months previously. This isn’t my opinion. This is a fact. With the help of Rinxter, we can look at bout statistics and prove—beyond the shadow of a doubt—that the “slow derby” game has been bad for roller derby, turning beautiful games featuring clean skating, into ugly affairs filled with penalties. If you’re someone who likes the “strategy” game, then you’re going to have some explaining to do: The numbers will prove that you also like games filled with rule violations and box trips galore. I’ll start with the Gotham/Philly game of 2009, which is far and away my all-time favorite roller derby game…so far. Rinxter hadn’t been invented yet, so penalty numbers were not immediately available. Instead, I re-watched the game—something I highly recommend you do as well, because it’s a friggin’ awesome game—and manually counted up the number of penalties* committed by both teams. After the first ten minutes of skating nirvana, there were 26 Gotham penalties and 18 Philly penalties, a total of 44 penalties between both teams. At the time of their game, Gotham and Philly were two of the best teams in the country, featuring some of the best skaters in the country. If the best can skate a close game with only 44 penalties, it would follow that as the best get better at derby skating and earn more game experience, they would commit fewer penalties in similarly competitive games. This will be our baseline for comparison going forward. The baseline number established in the Gotham/Philly game the year before seems to be holding here. Interestingly, there were fewer penalties in blowout games, and more penalties in closer games. There isn’t much data to verify that claim with, but it makes sense on the face of it: With more on the line, teams may try to do more at the risk of getting more penalties. Oly and Rocky Mountain were the most heavily-penalized teams shown here, although that didn’t seem to hurt them on their way to facing each other for the 2010 championship. Coincidentally, Gotham kept their penalty counts extremely low. That didn’t necessarily lead to success, as their game against Rocky Mountain would indicate. But overall, these were competitive games, and few or fewer penalties were comitted than in our baseline game the year before. Looking good so far! Note that these teams played in other games, and there were also many other games between a lot of other teams not listed in this table. But for the purpose of this article, I’m only interested in seeing the progression of the “best” teams playing in the “best” games, where one would expect the number of penalties to be kept under control by the “best” skaters. At the west regional final, Rocky and Oly, played one of the best games of roller derby I had seen since Gotham/Philly 2009. Although, Rocky Mountain has a reputation for being penalty-heavy, and their game against Oly at the regional final game may have been the one to cement that idea into people’s minds. Thirty penalties in one 60 minute game is a hell of a lot to take. However, compared to the other 2011 regional finalists, Rocky Mountain was a regular Lady Byng. 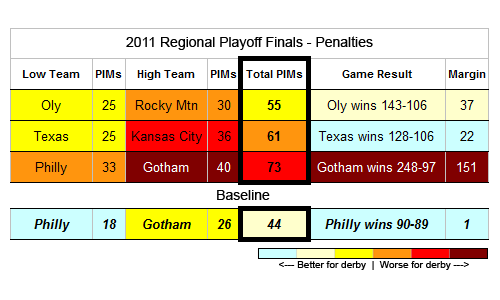 Kansas City, Philly, and Gotham all committed more penalties in their respective games, than did Rocky against Oly. That Philly/Gotham game in particular was an ugly one all around. With 73 total penalties—almost 30 more than their amazing game in 2009—and a 151-point margin of victory, it was not what you would call roller derby at its best. But hold on a second…that doesn’t make sense. With two more years of experience, both teams should have improved from their historic meeting and committed fewer penalties. They managed to stay out of the penalty box at Championships the year before. But instead of getting better and skating cleaner, both teams somehow got worse in 2011? Thankfully, Rinxter data for the 2011 Championships is just about complete. We can use their treasure trove of information to get to the bottom of this mystery. This last table shows all games between the best of the best in the WFTDA: Gotham, Oly, Rocky Mountain, Texas, Kansas City, Windy City, Philly, and Rose City. Playing at the WFTDA Championships, all of these top national teams would almost certainly be doing whatever necessary to skate clean and stay out of of the penalty box! What an awful, bloody mess. All that red is proof positive that all teams were guilty of committing a gross number of penalties, especially when you compare it to our baseline game of Gotham/Philly 2009. Virtually all the games played in Denver at Championships this year had penalty totals approaching twice that of one of the best games of derby ever played just two years ago. While it’d be really easy to just look at the scores and see how many close and competitive games there were, one would be foolish to ignore the proverbial bloodbaths that were the Rose/KC game, the Rocky/Gotham game, and the Gotham/Oly championship final. Not only that, the other headlining games played at championships weren’t exactly neat and tidy, either. Just consider the best three best roller derby teams in the country. Gotham, Oly, and Rocky Mountain have been at the top of the WFTDA for years, with the last four Hydras being claimed by those three teams. When Rocky Mountain and Oly played each other in October, their game had the fewest total penalties of all the games between DNN Top 10 teams Rinxter has 2011 playoff penalty data for. This would be expected, considering those two teams are some of the best in the WFTDA. 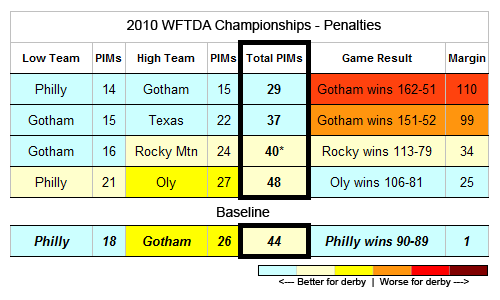 Yet somehow, when these two clean-skating teams each played against Gotham at the WFTDA Championships, there were 30 more total penalties committed against the new champs than in their game against each other. Doesn’t that strike you as odd? Penalties are a part of roller derby, as they are in other team sports. But that many penalties? Why were there so many in the two games Rocky and Oly played against Gotham, games (allegedly) featuring the best of the best roller derby has to offer? If anything, shouldn’t there be fewer penalties? 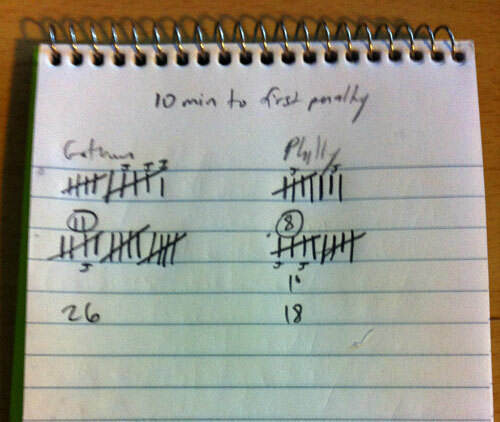 In our baseline game, Gotham committed 26 penalties against Philly. That number was probably an outlier (and surely a factor in the upset) considering that during the 2010 Championships, Gotham was good for about 15 penalties a game, an extremely low number. Again, that kind of clean play is to be expected from an elite team with another year of skating experience under their belts. 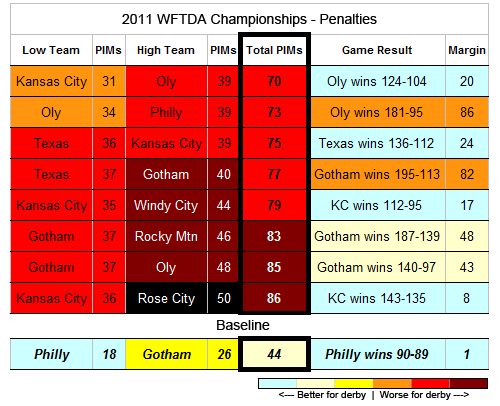 However, the 2011 WFTDA Champion version of Gotham somehow found themselves in the penalty box nearly 40 times a game during their critical playoff match-ups. 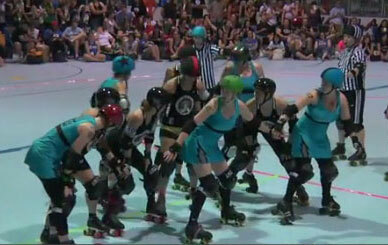 The Gotham of 2010 had proven to us that they can skate an extremely clean game of roller derby. But according to the numbers, the Gotham of 2011 had just as hard of a time staying out of the penalty box as did their opponents. It looks like Gotham is the wrench in the works here, the common factor in all of these messy, penalty-heavy games. So that begs the question: What changed between the Gotham of last year, and the Gotham of this year? A pile of humanity containing Gotham and Philly skaters. Awful! Since Denver started the trend in 2009, roller derby has been played at a slower and slower pace. As the months went on, more and more teams adopted and refined this stifling style of play. By the start of the 2011 season, almost all the top teams in the nation relied on slow derby start strategies. During this same time, the number of penalties committed in games increased dramatically. When Gotham mastered slow derby, their games at the regional playoffs and during championships were some of the most penalty-heavy games in recorded roller derby statistical history. This is not a coincidence, either. Slow derby is clearly the cause of the high volume of penalties being committed by teams across the WFTDA. This makes a lot of sense if you think about it, because slow packs mean blockers and jammers have to fight a lot harder to get around a massive wall of bodies, making cutting, back-blocking, out-of-play, direction-of-play, and other blocking fouls much more common and prevalent than was present in our fast-moving 2009 baseline game. Or the fast-moving Oly/Rocky game at west finals this year, for that matter. Yet, there are some (that’s some) people out there that prefer this penalty-heavy style of roller derby. They might even tell you that here and now, roller derby has never been better. If that were true, the stats would be trending downwards toward a game that had few or no penalties. But instead, they’re indicating the opposite, that penalty counts have skyrocketed. Strictly by the numbers, roller derby has actually never been worse. If roller derby is supposed to be a five-on-five team sport, then there was little or no “roller derby” seen at Championships. But there was plenty of “slow derby,” “stopper derby,” “noller derby,” “stroller derby,” “rugby derby,” “ruler derby,” and “four-on-four derby” to be had. 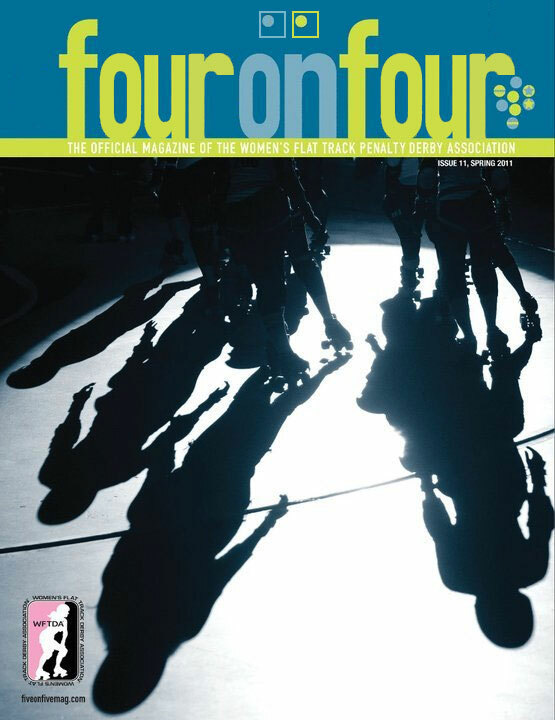 The special Championships Edition of the WFTDA official magazine. Hopefully, never again on newsstands. That it came to this isn’t really anyone’s fault. I’m not writing this article so I can assign blame to WFTDA, or a specific team. Just like we can’t completely blame Dutchland for their forfeit against Gotham earlier this year, we can’t completely blame Gotham, or Philly, or Denver, or any single team for reading between the lines of the rule book and crowding themselves at the jammer line, or standing around and doing nothing at jam starts, or stopping at the rear of a pack during a power jam, or skating backwards in packs, or anything like that. It was just the inevitable conclusion to the competitive nature of team sports, with players doing whatever it takes to win, using a rule book rife with unfair loopholes and grey areas to do it. It’s tragically unfortunate that this directly led to a record number of penalties committed by the “best” teams in the nation, the absolute last thing new fans would want to see when it comes to showcasing the sport to the masses. I think the WFTDA is going to look at what happened this year and take away some valuable lessons as it moves forward to grow and expand the sport. I bet we’ll never see them try and run the same set of rules for two straight years again, for starters. We saw how quickly the game changed from the start of the 2011, to the middle of the year, to The Big 5 season. Rules need to keep up with what its players are doing on a constant basis. All amateur, collegiate, and professional sports leagues—including the 95-year-old NHL and the 142-year-old MLB—change their rules at least once a year to ensure fair competition within changing times. I think the WFTDA realizes that now, so roller derby should be doing the same from here on out. But there’s something more important that I hope the WFTDA will come to understand. One of the original motivations behind the creation of the WFTDA was to devise a standard set of rules that would bring together all the independent roller derby leagues under one unified umbrella, thereby allowing for ease of interleague play. By extension, this made the game more accessible to anyone that wanted to play it, growing the game nationally, and internationally. There are now 124 WFTDA member leagues and a thousand more leagues throughout the world playing under WFTDA rules (or some derivative thereof), so on that front it’s mission accomplished. But the second a team wants to play a game to win first, skating be damned, you run into big problems. (See: Rat City/Rocky or any Gotham 2011 playoff game.) One of those problems is a ridiculous number of rule infractions by all the best teams in the country, as confirmed by Rinxter stats. When the WFTDA and its member leagues vote on a new set of rules for next year, I hope that they look at derby not as a “fun game that can be competitive,” but a “competitive game that can be fun.” There’s a big, BIG difference between the two, and depending on how the rules get changed for next season (and beyond), we’ll see what kind of game the skaters really want to play. Frankly, I’m excited about it. I know for a fact that my suggestion for new pack definition rules is being considered by the skaters for the 2012 rules. Surely, there are many other ideas on how to put the “roller” back into roller derby being put through their paces. However the players vote on how to change the rules, I can guarantee you that the slow derby tactics that started in Denver two years ago, also ended in Denver earlier this month. Surely, a majority of WFTDA leagues—and certainly two out of the best three teams in the country—will want to all but eliminate “slow derby” tactics from the game, and the penalty-heavy play that goes with it hand-in-hand. When the players voted in the current rules more than 18 months ago, no one imagined that they would be playing the slower, “rugby” style of roller derby that took over the sport like a virus. If they did, it would have been written into the rules from the start. Besides, if they wanted to play rugby, they would have joined a women’s rugby club. Not a roller derby league. I’m confident the players will do what it takes to get roller derby moving in the right direction again. What I saw on September 13, 2009 was all I needed to see to be sure of that. How they do it is up to them, but now that they know what not to do, it’ll make it easier for them to make good decisions. Here’s what I say: Beyond a shadow of a doubt, the slow game breeds sloppier skating and more penalties, and roller derby is worse off because of it. So, Mr. and Mrs. Slow Derby Fan, I’m giving you a chance to defend yourself. I want you to explain to everyone why you like games that have nearly as many penalties as a team has points. I want you to explain to us why derby fans have been using terms other than “roller derby” to describe the game primarily played during the playoffs. I want you to justify your ignorance of why derby fans have “Occupy the Pivot Line” signs and boo their own home teams when they engage in extreme slow derby tactics. I want you to to prove me wrong when I say there were better roller derby games played two years ago, than there were at the WFTDA Championships two weeks ago. Because I’ve explained why the slow game is bad for roller derby. I’ve backed my claim up with facts. But I’ve yet to see a reasonable explanation as to why the slow game is good for derby. And I’m still waiting for one.